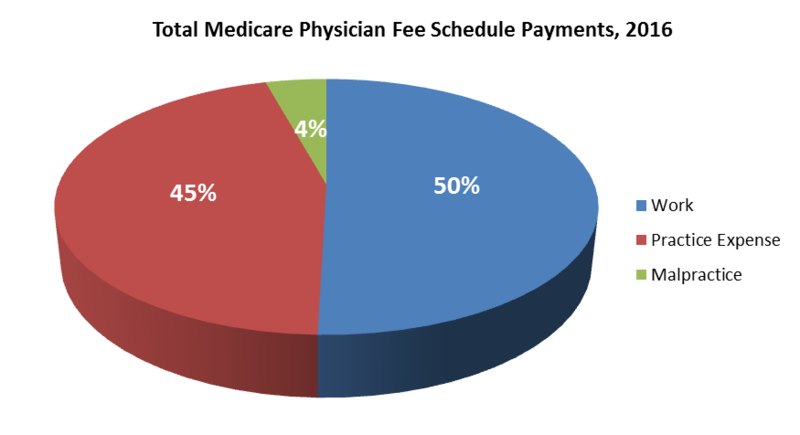 Medicare payment to physicians under the Medicare Physician Fee Schedule (MPFS) is based on relative value units (RVUs) representing physician work, practice expense and malpractice insurance. These RVUs are multiplied by a conversion factor and geographic adjustment factors to determine the payment rate. Practice expenses account for a substantial portion of the overall payments made under the MPFS. For example, payments for practice expenses constituted 45 percent of total MPFS payments in 2016. McDermottPlus analyzed payments made in 2016 under the MPFS. 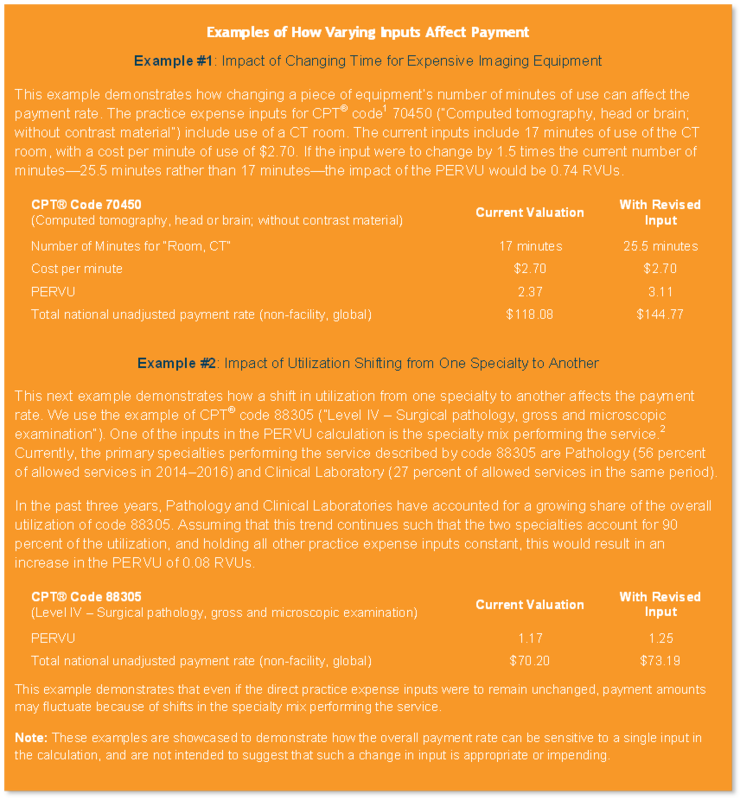 Using utilization data on allowed services from the Utilization Crosswalk file (CY2018-PFS-FR-Utilization-Crosswalk-2016-2018) and national unadjusted payment amounts, McDermottPlus estimated overall payment amounts for work, practice expense and malpractice, and calculated the percent of payments attributable to each. 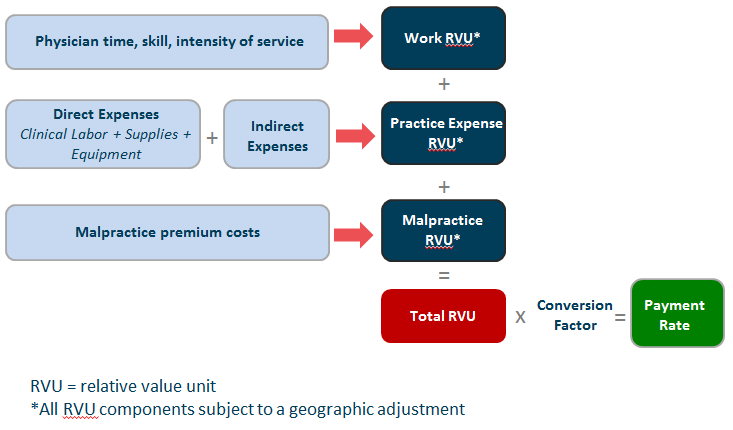 Practice expense inputs for equipment, supplies and clinical labor (called “direct” practice expense inputs) are used as the first step in a multi-step calculation to generate practice expense RVUs (PERVUs). Direct practice expense inputs do not translate directly to practice expense reimbursement. Instead, the Centers for Medicare & Medicaid Services (CMS) employs a multi-step, complex calculation with numerous inputs to convert practice expense costs to reimbursements. For more information on the PERVU Calculator, please contact Paul Radensky at +1 202 204 1450, Christine Song at +1 202 204 1453, or Eric Zimmerman at +1 202 204 1457. CMS recently implemented a policy to use an average of the three most recent years of available Medicare claims data to determine the specialty mix assigned to each code. Prior to implementing this policy, CMS used the most recent year of available claims data to determine the specialty mix. This change in policy was intended to minimize the impact of year-to-year fluctuations in specialty mix.